At the beginning of 2004, Luciano Nincheri and I decided to create the Ennebi brand. Our purpose was to design and build wrist and desk instruments for collectors and watch lovers. This had to be done by means of the highest technologies, though maintaining the care and the uniqueness of the handcrafted product and faithfully carrying on the italian tradition of watch building. This job is the perpetuation of the technical and designing tradition belonged to a group of people that in the past made devices and instruments for the Italian Navy. I worked for years in the research and development sector of a Florentine Company, now closed, well-known by watch collectors. 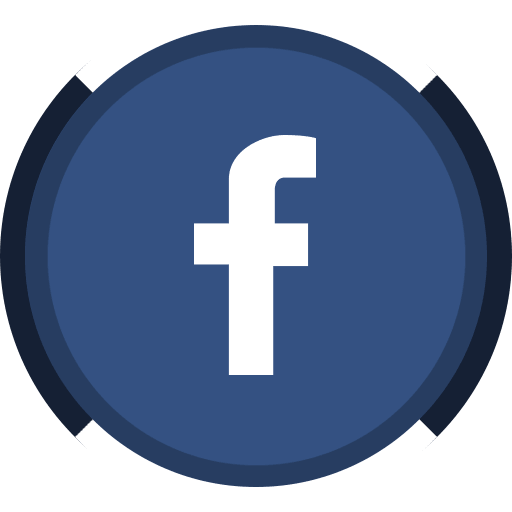 My partner, Luciano Nincheri, is an expert designer of electrical systems and plants as well as a profound connoisseur of high technology sector productions. I would like to talk about the origin of Ennebi by starting from a very long time ago. For sure, my attitude for mechanics is a heredity, say almost genetic, from my father, Armando Bettarini. It was about the 1925. It was a few years after the end of the first world war that my father started to work on his own. He was only twenty. It was the last phase of the unification process in our country, but both the economical and the social conditions of the Italian population were critical. My father worked mainly on plates by means of the lathe, the so-called “tiratura in lastra” (“plate pulling”) technique. 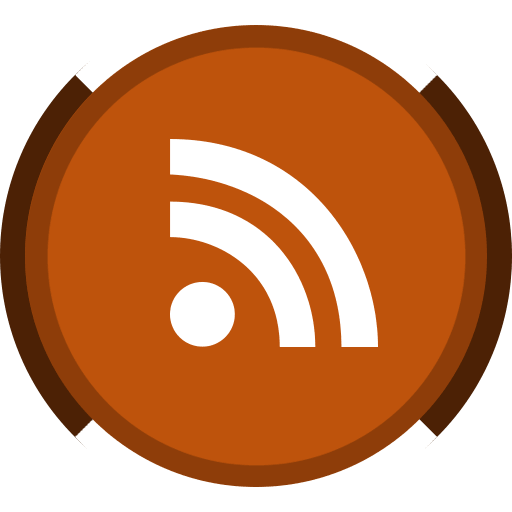 In few years, his initial small workshop grew up, he had the first employees and he started also to establish business relations with big companies within the Florentine area. My father moved the head office several times to comply with the need of bigger and bigger spaces for the machinery and employees. At the end of the thirties, even the collaboration with those companies supplying the War Ministry increased. 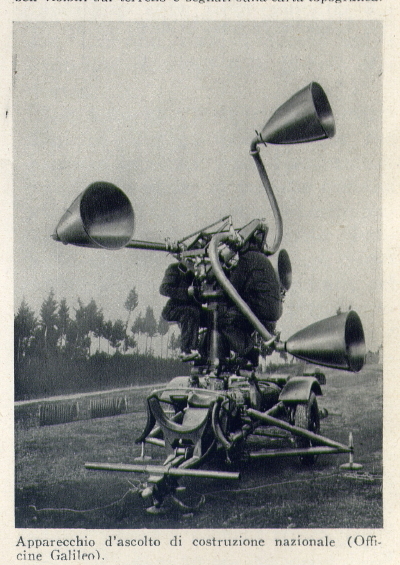 Among the other things, my father’s company used to produce giant aluminium cones which worked as special “ear trumpet” (see figure 1): they were mounted on carts, which could traverse and/or elevate, and used by usually two blind persons because of their bigger auditory sensitivity. According to the expectations of the technicians, these devices had to promptly detect the direction and the height of enemy’s airplanes and so to provide these data to the anti-aircraft. At that time, the company was located very closed to Ponte Vecchio and Palazzo Pitti, in the city centre. It consisted into a few rooms at the ground floor of a building next to the Vasari corridor. In 1944 on August, Florence was the battlefront between the Anglo-American troops that were moving forward to the North and the German and Salo’ Republic troops that were receding. Several fights were held within the city, on its streets, and Germans decided to destroy all urban bridges, but Ponte Vecchio, in order to slow down the arrival of Anglo-American troops. Yet, all the buildings near Ponte Vecchio, on both sides of the Arno river, were crushed to prevent its use. My father’s company was among those buildings (see the figure 2). So, his workshop was under the debris of the war. The only thing he and his employees could do was to recover all the materials and still-operating devices and to start again as soon as possible somewhere else in the city. The new head office was located at the suburbs of Florence. It was a small two floor building. Fig. 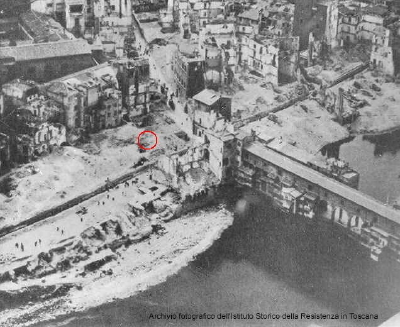 2: Distruction of Ponte Vecchio area (the red circle indicates the location of my father’s company). There, the most disparate things were produced: antennas of naval radars, pieces of gas turbines and pieces of scientific instruments for the National Research Centre. I started to work with my father’s workshop in 1965 because of a serious illness of him. In 1970, I built a numerical control lathe conceived for the fluo-turning, with the assistance of Luciano Nincheri for what regards the part related with the fluid dynamic. At the beginning of 1980, after that my family workshop had been an external supplier of Officine Panerai for several years, I was employed by Panerai and I had as first duty the testing activity within reaserch jobs that the company carried out mainly on demand of the Italian Navy. After a few years, I became the manager of the mechanic planning and drawing sector of Officine Panerai. Thanks to my position as manager of the drawing sector, I was able to gather information about the activities of the past, and so to know about underwater instruments and watch models made to fulfil the operating needs of the Italian and Foreign military divisions. The company did not produce watches for a long time. In 1982, due to my efforts, I was allowed to contact some watch-making operators. I remember to have shown the Panerai watch model the “Egiziano” to the commercial manager of BINDA, a company in Milan, who then was interest to have a collaboration. Yet, our director refused this offer because he did not want to have a commercial relationship at the same level, but to maintain a leadership position. Moreover, in that period Officine Panerai had many orders from the Italian Navy and so they could not allow workers to waste energies for other activities. I kept on insisting till the company decided to plan and build a new watch to present to the attack diver unit of the Italian Navy. The purpose was to make an up-to-date instrument after several years of inactivity in the watch-making sector. It was decided to maintain the lever closure on the recharging crown as a testimony of the company tradition and as attitude of continuity, although it was not needed from a technical point of view. The watchcase was totally made of titanium, with a luminous face and a synthetic sapphire glass. It had a mechanic movement with automatic recharge and a visible second hand to allow one to look at the watch in operation. After a few pre-prototypes in laboratory, the watch was delivered to the unit of attack divers of the Italian navy to be evaluated. Fig. 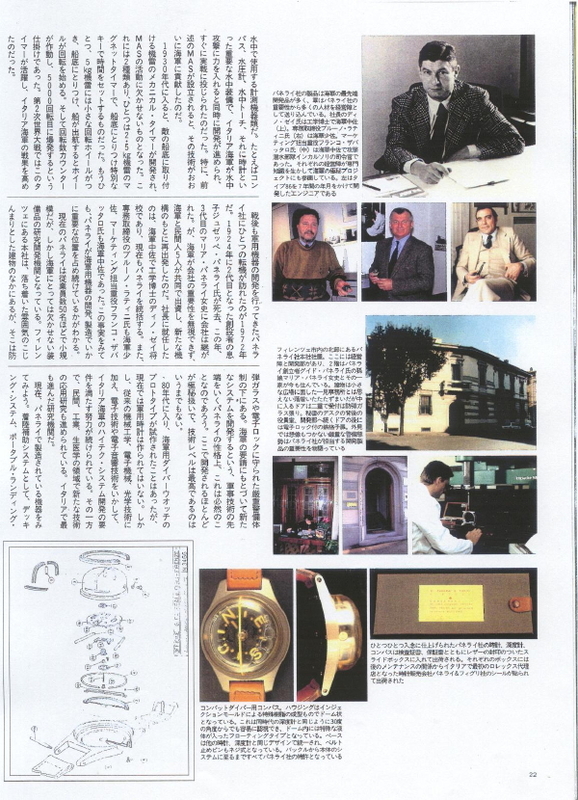 3: Japanese review speaking about Panerai’s tools (I am the first on the left on the second row). Although the positive results of these tests, no orders were made. Together with the most important instruments made by Officine Panerai, the watch was shown at Naval Exhibition held in Genova in 1985 that was the last one organized in Italy. In that occasion, that was not open to the public and despite of the huge presence of Carabinieri and security men, the watch was stolen from the display cabinet. After an in-depth research the theft was denounced, but strangely on the last day of the exhibition the watch came out under the cabinet. For a few years the watch production was stopped; the only wrist devices that were produced were compasses and some kind of depth- gauges that were appreciated and requested by the special units of Italian and Foreign Army. At the end of the 80’s the situation changed. A small publisher, Ermanno Arbertelli Editore, published a book about the equipment used by the attack divers during the Second World War. In one of the chapters of the book, whose title was “I MEZZI D’ASSALTO DELLA Xa FLOTTIGLIA MAS” (“ASSAULT DEVICES OF THE Xa FLEET MAS”), the authors, Marco Spertini and Erminio Bagnasco, spoke about the arm compasses, subacqueous torches and watches provided by the Officine Panerai. A Japanese military and watch review publisher was going to publish this book for the Japanese market and so he sent a journalist to visit the still working companies which provided all the devices for the assault divers of the Army. This visit of the Japanese journalist, together with a French colleague of him, urged the company to think about the opportunity to start to produce again watches for professionals and amateurs. The reduced number of orders from the Army did the rest. The first set of watches was produced totally in Swiss, for what concerns both the construction of the watch cases and the mounting and testing procedures. The watch models were essentially two: Luminor and Mare Nostrum. Both of them referred to models of the past: the former was a wristwatch really made for production, instead of the latter that was just a prototype. All the versions of Luminor were much appreciated, but Mare Nostrum was not well accepted. It was decided to make the second set of Luminor watches totally in Italy. The most of the suppliers were from the area of Florence. The company had economical problems and it was decided to sell the watch brand together with the branch of the company involved in watch production. Since this transfer had concluded before the second set of watches was finished, the first models produced in Italy were directly delivered to the new owner. Officine Panerai became a brand owned by the VLG group. Due to this deal, I started to collaborate with the new group, and this relationship was managed by the Florentine company that changed its name to Panerai Sistemi. This collaboration lasted for four years. In the meantime Calzoni, a Bolognese company working in the military sector, purchased Panerai Sistemi. After a few months I broke off my collaboration with this company and I started to discuss often with the friend of mine, Luciano Nincheri, whose acquaintance was dated back to the works with the numerical controlled lathe, about the possibility to plan and build wrist devices to measure time and for navigation. Our intention was to establish a company carrying on the Florentine tradition lost with the sale of the Officine Panerai brand and to find an appropriate way to point out this continuity. I made the former colleagues of mine known about my intention because their collaboration would have given more importance to the continuity with the past. After a few years my project had not started yet due to some uncertainties. The determination of Luciano and mine to make instruments for professionals and amateurs urged us to establish the company ENNEBI (whose name is the result of the joining of our surnames’ initials). The main purpose was changed: we did not want anymore to point out the continuity with the Florentine company tradition I had worked with. Our products should have made the grade on their own. We wanted to underline the Italian, and in particular, the Tuscan origins of the products and we would have used as much as possible the collaborations with Italian companies, at all costs. On February of 2004, the ENNEBI Company was established with the head office located in the Florentine countryside area of Chianti. The first watch that ENNEBI produced after just six month from the foundation was a professional instrument that did need a long and accurate work cycle. Its name is FONDALE and it derives from the operating environment it can work in thanks to its technical features. IX REGGIMENTO, a watch engineered according to suggestions and technical specification of XI Reggimento “Col Moschin” Corps. Instruments made by ENNEBI are distributed all over the world directly or by means of associates companies.